Millions of Americans have hearing loss, and in many cases, their hearing loss was entirely preventable. While there can be certain factors which can increase your risk of hearing loss, our hearing specialists want to help you learn more about how you can protect your hearing to prevent future hearing loss. Sensorineural hearing loss is often associated with noise-induced hearing loss. This type of hearing loss is brought on when the delicate hair cells in your inner ear become damaged. The damage often happens due to loud noise expose, and once these hairs are damaged, your hearing loss is irreversible. 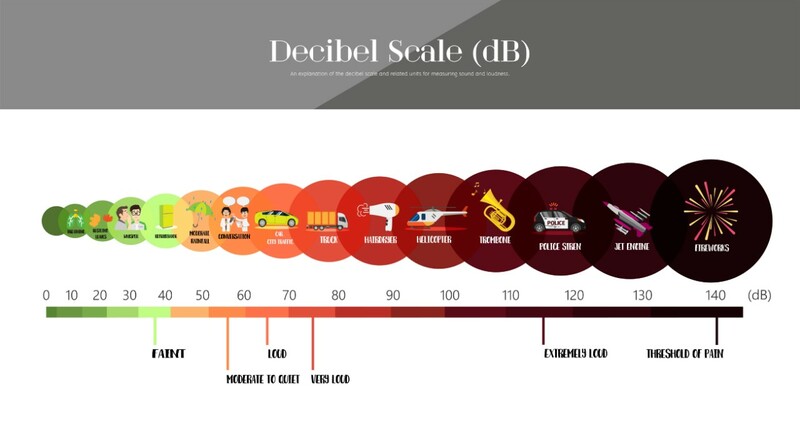 To help understand the various noise levels and how your hearing acts, feel free to consult the decibel scale (dB) graphic below as we explain further. Basic awareness of what decibel levels are damaging is important to help you prevent hearing loss. To start, sounds between 85-95 dB are when hearing loss can begin. Sounds in this range generally require longer exposure to cause damage, so about 1 ½ - 2 hours of being exposed, hearing loss can occur. However, not all types of noise-induced hearing loss require long term exposure. Explosively loud sounds, such as fireworks and gunshots can reach dB levels above 140 dB. Exposure to these levels can damage your hearing in a matter of minutes. In many cases, we can tell that something is too loud for our hearing, as it will register as painfully loud. However, if you know you will be attending a noisy event such as a concert, it would be a good idea to pack a pair of earplugs. Protect your head and neck - Whether you enjoy mountain biking, four-wheeling, or other activities where you could suffer head or neck injuries, do your best to follow the best safety practices. Injuries to the head or neck can lead not only to painful rehabilitation but can also cause hearing loss. Check your medication - Many people take hearing damaging ototoxic medications every day. These medications are not limited to prescription pills; simple over-the-counter painkillers like aspirin can cause hearing loss, though not all of the medications have a permanent effect on your hearing. Do not insert things in your ear - It sounds simple, but many people can’t resist the urge to try and “clean” their ears with inappropriate items like Q-tips. If you do struggle with earwax buildup, our hearing specialists can safely remove the blockage and provide you with at-home solutions which are safe to use. Use appropriate hearing protection - There are many types of hearing protection, and by using the right one for your need, you can keep your hearing healthy. Earplugs - There are various types of earplugs, from the cheap and disposable foam earplugs to the high-end electronic earplugs. Their main benefit is their easy portability, but this type of hearing protection leaves the sound-transmitting bones around your ears vulnerable to loud sounds. Earmuffs - These heavy-duty hearing protectors can be fully soundproofed or opt for electronic earmuffs where you can choose to let in sounds at a certain dB range. With this type of hearing protection, you have whole ear protection, but the downside is that they can be quite bulky. Custom protection - If you are a swimmer, musician, or have other specialized hearing protection needs, you can work with our hearing specialists to find the right protection for your hearing. One of our most popular hearing services is our diagnostic hearing evaluation because it is a key component in protecting your hearing. Our hearing specialists recommend having a hearing evaluation at least once a year to ensure your hearing is in good order. A hearing evaluation allows our specialists to track how your hearing is from year-to-year and what areas your hearing may need more attention and support. Our specialists can make recommendations after your hearing test to help you keep your hearing healthy. Also, if you do start to develop hearing loss, which is common as we age, by having regular hearing tests, the loss will be caught quickly. The sooner hearing loss is treated with the right hearing solutions, the better the overall outcome. Whether you would like specialized hearing protection or a routine hearing evaluation to check for hearing loss, our hearing specialists can help you. Contact us to set up an appointment in one of our four convenient hearing clinics.